A breakdown of typical pack hierarchy. Like wild wolf packs, werewolves have a pack hierarchy to help maintain order. Werewolves naturally feel an extreme loyalty to their pack and treat it like family. The numbers in brackets beside each position indicate how many werewolves may occupy that position within a pack. Alpha: (one - two) this is the pack leader and figure head; usually a very dominant, bold and charismatic personality. The alpha is responsible for maintaining order and protecting the pack. Beta: (one-two) the Alpha's second-in-command; this is usually their most trusted and loyal friend. The Beta takes the stance of leader in the event that the Alpha must leave the territory or is otherwise indisposed. Gamma: (one-two) the pack's head teacher. The Gamma is responsible for the mentoring program, pairing mentors with students so that every werewolf is given the opportunity to harness their Gift, how to hunt, and physical combat. Delta: (one-two) the pack's head medic; they are also responsible for keeping in touch with each of the pack's epsilons. The Delta is effectively the Alpha's eyes, watching over the pack regardless of how large it is with the help of the epsilons. Epsilon: (4-5; more epsilons are promoted as the pack population grows) These wolves are leaders of various sub-packs, each responsible for keeping an eye on the wolves within their sub-pack. Each sub-pack has a generic duty, such as scouting/patrolling borders, organizing hunting parties, and recruiting new werewolves. Zeta: (unlimited number) pack members who have established themselves as loyal, reputable individuals. They may be paired with younger werewolves as a mentor. 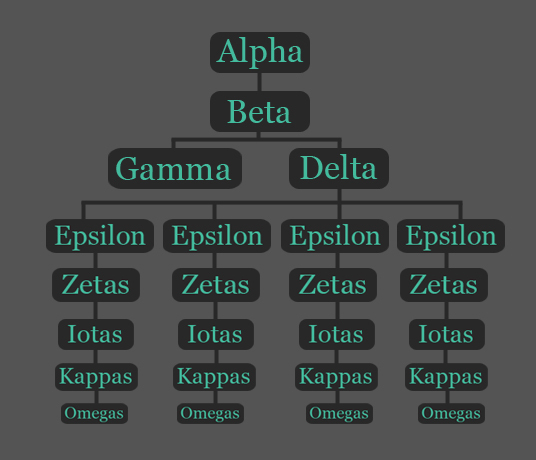 Iota: (unlimited number) a pack member with seniority over Kappas due to experience or proven loyalty (automatic promotion after your character has 20 in-character posts). Kappa: (unlimited number) a regular member of the pack. Omega: the lowest ranking member; this individual must have done something to incur the pack's disdain. They're forced to eat last at meals, and many of the other werewolves will take out their frustrations on the omega.